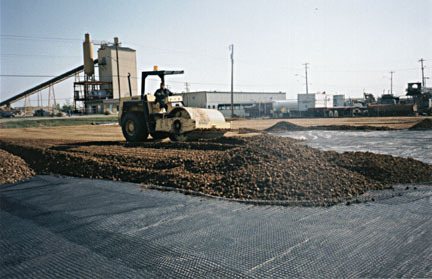 Biaxial polypropylene geogrids are used in base reinforcement applications such as roads, storage yards and parking lots or any other load bearing structure. Biaxial polypropylene geogrids provide good tensile strength in both principle directions. The reinforcing action of RX geogrids lies mainly in increasing the shearing resistance within a soil by a process of interlocking between the square ribs and the soil. The load dispersal effect from the interlocking mechanism is more effective and can reduce sub-base thickness and construction cost. RX geogrids can be used with any kind of fill material. One layer or multi–layer construction distributes loading and disperses stress more effectively, leading to the reduction in differential settlement and improved foundation bearing capacity.